This salmon dish is so easy and so tasty. It’s great for entertaining too. The dish has been approved by our family (even the kiddos) and every guest we’ve served it to. This recipe is adapted from the October 2008 issue of Southern Living. Marinade: in a saucepan, cook orange juice through ginger over medium heat, for 1 minute; let cool slightly. Reserve 2/3 c. marinade. Pour remaining 1/3 c of marinade in a zip top bag and add salmon to the bag. Refrigerate and marinate the salmon for 15 minutes. Meanwhile preheat oven to 375. After salmon has marinated for 15 minutes, discard the marinade and bake salmon for about 20 minutes, or until done. While salmon is cooking, cook the reserved 2/3 c. marinade over medium heat for 10 minutes, or until sauce is thick and syrupy. 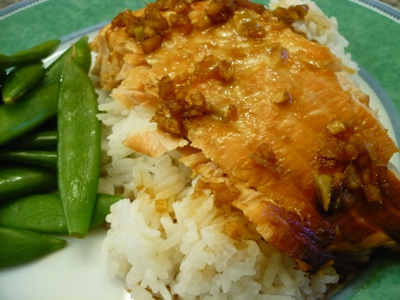 Serve salmon over hot rice and drizzle with the cooked sauce. © The Cookbook Smasher All Rights Reserved. Powered by zAlive.